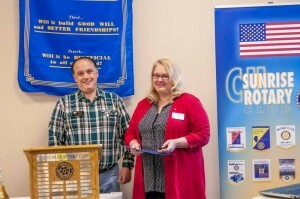 On February 9th, C-U Sunrise Rotary Club member Robin Ferguson was presented her first Paul Harris. District Governor Kevin Yonce was on hand to present Robin her pin and certificate. Congratulations Robin.